In middle age, my ears can’t tolerate booming bass any longer. Seems like amped lows is the state of audio design, and this is unfortunately standard among wireless cans. That’s one reason I use Grado Labs’ Rs1e reference headphones, which give better balance across the range, particularly warm midrange and highs. But the RS1e means a cord, which largely inconveniences my digital lifestyle. I would rather listen to music, podcasts, and such while on the move in the apartment, or elsewhere. My last set of Bluetooth cans delivered way too much bass, and I sold them when buying the Grados. Last night, after reading professional and purchaser reviews, I bought a pair of Sennheiser Momentum 2.0 wireless headphones from Amazon, My quick, out-of-box impressions follow. To start, the retailer’s free, same-day delivery service is outrageous. I ordered at 11:20 p.m. PST, and the package arrived at 8:58 a.m. Wow. Yes, I spent Saturday night researching wireless cans. The Momentum headphones look and feel fantastic. The design and construction are exceptionally appealing. My eyes love them. My ears take pause, however. There’s a fullness that the Grados lack, and that’s a negative because it’s the punchy bass I hear. If my ears ache or quickly fatigue, the low range demands too much of them. Based on reviews, I expected more balanced bass, which isn’t as pumped as my old Sonys. Connecting to Nexus 6p via Bluetooth was immediate during initial pairing. The Sennheiser cans are immensely comfortable. I chose on-ear as opposed to over-the ear because they cost $100 less, aural benefits appear to be identical, the smaller size appeals to my design aesthetic, and I hoped to diminish some noise-cancellation. Bigger bass coupled with noise-cancelling tech makes music sound artificial compared to the Grados, which produce unquestionably more authentic sound. However, that’s an unfair impression for headphones used for about 90 minutes and not given so-called burn-in period, which I do by no more than listening normally; because there is legitimate controversy about whether the practice loosens up the diaphragms or the ears adjust to the sound. Tidal streaming is intolerable to my aged ears using Momentum out of the box connected to Nexus 6p, which does not support the aptx codec that in theory gives more from lossless streaming over Bluetooth. Many of the subtle nuances I detect listening to the Grados streaming Tidal compared to Google Music are lost. The other service is in some ways better because the Android app provides a graphic equalizer—never used with the RS1e—I can use to cut back some of the bass. 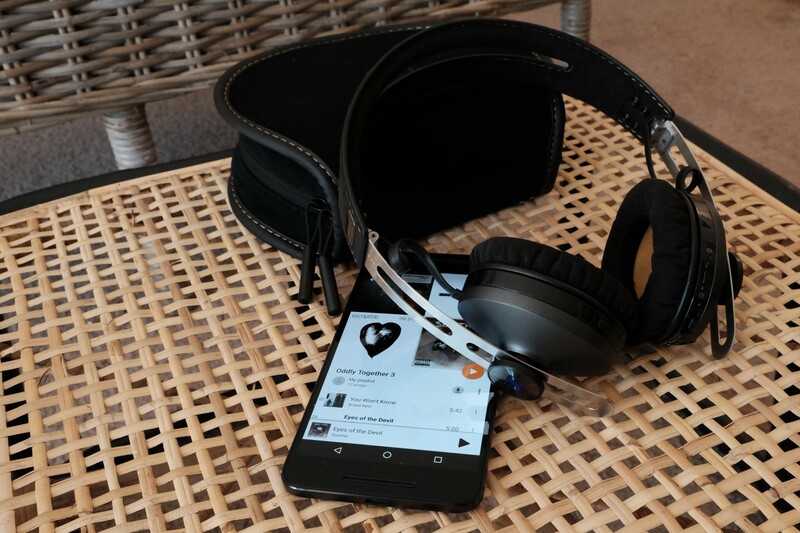 Perhaps because of subjective expectations, depending on the track, I find Tidal to be tolerable, and enjoyable enough early on, connected to HTC Nexus 9, which does support aptx—or so the specs claim (the aptx website doesn’t show the tablet). The quality is nothing like the Grados. Both cans deliver defined and satisfying soundstage but bigger bass makes Momentum feel fuller. That said, I expect my ears will fatigue faster than with RS1e. Generally speaking, I really like Sennheiser Momentum 2.0 wireless headphones out of the box. Whether or not they like me is the question—how my ears tolerate higher lows (now there’s an oxymoron for you). If they replace my Grados, I will cancel Tidal and keep Google Music, which sounds good enough and not as uncomfortably bassy. Convenience drives change: No wires, volume controls easily reached, and light, compact, folding design.